They are made from semolina. They’re meant to be cooked in and served in a light soup, such as a broth. They can also be used for pasta salads. Italian Wedding Soup, a well-known soup, often uses Acini di Pepe. An American salad, Frog’s Eye Salad, uses Acini di Pepe along with mandarin orange pieces, pineapple pieces, whipped dessert topping, and marshmallows. Bring liquid to a boil. When the liquid reaches a boil, add the Acini di Pepe, lower the heat and start timing. For salads or tender to the bite: cook 6 minutes. For al dente (tender to the bite) in soups: cook 6 minutes. For soft in soups: cook 8 minutes. For broth type soups, per person, allow 200 ml (7 oz) of broth. 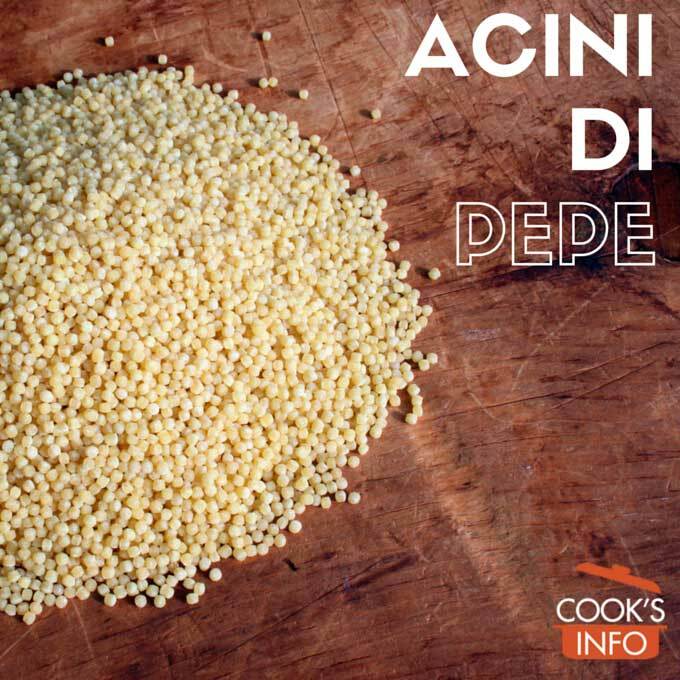 Use 30g (1 oz) of Acini di Pepe for a thin soup; 40g (1.5 oz) for a thicker one. Pronounced ah-CHEE-nee dee PAY-pay .